Apple iPhone X is one of the most revolutionary iPhones ever mostly because Apple removed lots of traditional iPhone design and philosophies, and replaced them with the latest technology available. The Touch ID is gone, and now we have Face ID, no bezels around the display and the best one is, there is no home button. The home button which Apple users are used to is now gone and replaced by gestures. Apple reinvented the whole concept of navigating around the iOS; there is a little bar at the bottom which does everything now. It even does a better job than the previous physical home button. The bar lets users to switch between apps without going to the app switcher – just a swipe on the bar will do. But if you own more devices like iPad along with the iPhone X then switching between these two devices may become uncomfortable and even challenging. 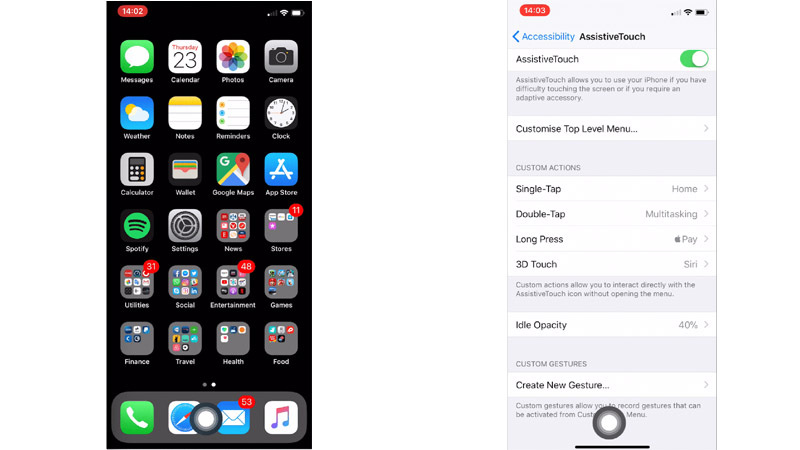 Well, iOS has a feature called Assistive touch which can bring back the home button on iPhone X. This feature is in iOS from so long, many users already know about this and are probably already using it. Regardless, if you want to know how to enable home button on iPhone X, check out these simple steps below to bring back the home button on iPhone X.
Unlock your iPhone X and go to Settings > General > Accessibility. Now tap on AssistiveTouch and enable it from there. On the same page, you’ll get different options like single tap action and 3D touch action. You can assign anything to tap actions; you can assign going to home screen with one tap and open the menu with 3D Touch. There is a long press and double tap gesture as well, you can even create your own gestures for the Assistive touch. There is a visibility option to make the floating button almost invisible or fully opaque.